Nathan Johnston is Head Coach of Dark Horse Athletics; a multisport club located in CFB Edmonton Alberta and geared toward serving military members. He is a serving member of the Canadian Armed Forces and is passionate about developing beginners in running and triathlon. Nathan also volunteers as a ride leader for another local road cycling club. He is a family oriented coach, with three young boys and a wife who is active in powerlifting and Olympic lifting. 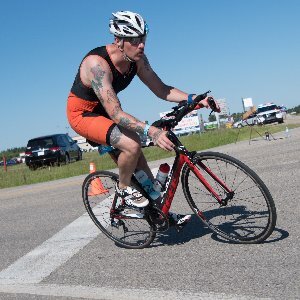 Nathan Johnston Nathan is an NCCP trained Community Triathlon Coach, living in Morinville Ab. He coaches part-time and has been serving in the Canadian Armed Forces since 2000. Nathan has seen success in the sprint distance triathlon. He has recently moved to 70.3 distance and continues to set new PR’s. Nathan has been coaching since November 2016 when he received his training from the Alberta Triathlon Association. He spends most of his sessions working with Dark Horse Athletics; runners who have been competitive in the Canada Games, NCAA cross country, and the 13.1 distance. He also leads rides once a week for a road cycling club, conducts clinics to educate athletes, and is on the pool deck to develop swimmers as required. He volunteers as a regional triathlon coach for junior athletes competing in the Alberta Summer Games. Nathans coaching philosophy is a balance of life and sport, and a progressive build. He highlights injury prevention, and performing movements efficiently. He understands the stresses imposed by life and training; and always monitors total life stress, not just training stress. Triathlon inspired him to make the best of his life, be a role model for his three children, and encourage newcomers to enjoy their journey in sport. He routinely employs strength training, core training, and plyometrics; all sport specific. Success. Coach Nathan Johnston has been notified of your message.